Operated by "Future Hawick" - Hawick's Future. Where will we start? Could it be because of name recognition? The name Hawick is internationally known through knitwear and rugby. Companies such as Barrie, Hawick Cashmere, Johnstons, Lyle & Scott, Peter Scott, Pringle and Wm. Lockie have proudly labelled their quality products for the international market as ‘Made in Hawick, Scotland’ while Hawick Rugby Football Club is known throughout the sporting world for 60 or more internationalists – ambassadors for the town – as well as for having won 12 Scottish championships, and two Scottish Cups. Visitors may well have heard the name of Hawick, and wrestled with its pronunciation. Perhaps our visitor is touring. Hawick lies in an enviable position near the gateway to Scotland and forms the buckle holding together routes between Carlisle and Edinburgh, and between Newcastle and Glasgow. The motorist will approach on uncrowded roads through the rolling hills of the Border, and will find the town to be an excellent base for forays into the neighbouring communities – to abbeys, castles and stately homes, just as the reivers did long, long ago. Today’s reivers might even be cyclists following the Borders Loop, or walkers on the Border Abbeys Way. Hawick offers a rich cultural and historical heritage, which can be seen in such events as the Reivers’ Festival in March or the Common Riding in June, in the museums at Drumlanrig’s Tower (currently known as Borders Textile Towerhouse) or in Wilton Lodge Park, or at the new Family History & Archive Centre at the Heritage Hub. Indeed researching family history is often the reason for visitors coming to the town. The Exile’s Reception at the Common Riding symbolises the welcome offered to ancestral Borderers. Armstrongs, Douglases, Elliots, Olivers, Scotts and Turnbulls have for centuries headed for new opportunities thoughout the world, and their Australasian, North American or Southern African descendants are keen to learn more of their roots. The friendly natives will be more than happy to talk with them about the old days and the changes, and will often be able to recount family links over the generations. Walks around the town centre reveal the secrets of that past – often on plaques attached to buildings. 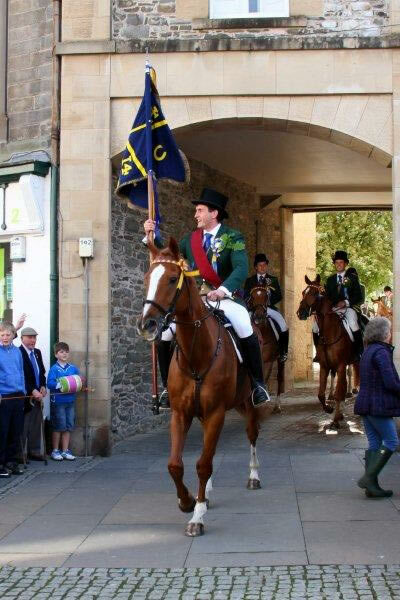 Talk to the Hawick Hosts, recognisable during the summer season in their blazered uniforms. They’ve years of experience and aim to provide answers to visitors’ questions. Walkers also have quiet country byways to explore within minutes of the town, while those rolling hills offer more manageable walking than in the more rugged Highlands. Golfers are well catered for by comparatively inexpensive courses at Hawick, Minto, Lilliesleaf and The Woll which all welcome day visitors. Wilton Lodge Park with its famous Walled Garden invites visitors for the casual stroll, while Teviotdale Leisure Centre provides action for the more energetic in its swimming pool, squash courts and fitness centre. There’s always something happening in Hawick. That Reivers’ Festival in March, the series of Ride-outs leading up to the Common Riding in June, the fortnight-long Summer Festival in August, and of course the town’s famous Christmas Lights display throughout December. Top hotels, comfortable guesthouses, welcoming bed & breakfast houses, well-equipped caravan sites – all offering accommodation to the visitor, as well as advice on how to get the most out of a stay in the area. Turn to their page in our directory for fuller details of their facilities. ……..So can our visitor learn anything of knitwear and rugby? Several mills have visitor centres and mill shops which stock quality cashmere and lambswool goods at discounted prices. They will be delighted to welcome you, and to encourage you to take a ‘Made in Hawick’ garment home with you. Hawick Rugby Club play at Mansfield Park on Saturdays throughout the season, in Scottish Premier League Division One. Their clubrooms are open to all and contain memorabilia associated with the club’s history since its establishment in 1873. But don’t overlook the Albion, Harlequins, Linden, PSA, Wanderers and YM: the other clubs which proudly uphold the town’s rugby heritage. Whether the visit to Hawick comes at the beginning of a Scottish holiday, or at its close, or indeed is the whole reason for visiting Britain, it’s sure to leave a lasting impression: a warm welcome, a community proud of its history, and the beautiful Border scenery. For more information on tourism in Hawick check the VisitScotland Borders website.